4 - In a series circuit, which of the parameters remain constant across all circuit elements such as resistor, capacitor and inductor etcetera? 5 - If there are two bulbs connected in series and one blows out, what happens to the other bulb? 6 - What happens to the current in the series circuit if the resistance is doubled? 8 - The currents in the three branches of a parallel circuit are 3A, 4A and 5A. What is the current leaving it? 10 - What is the value of current if a 50C charge flows in a conductor over a period of 5 seconds? 12 - What is the basic law that has to be followed in order to analyze ant circuit? 14 - A 250V bulb passes a current of 0.3A. Calculate the power in the lamp. 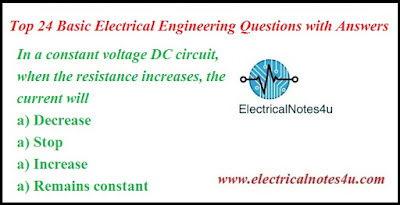 15 - Calculate the work done in a resistor of 20 ohm carrying 5A of current in 3 hours. 16 - The SI unit of power is? 17 - Which among the following is a unit for electrical energy? 19 - Which of the following statements are true with regard to resistance? 22 - What is the unit of temperature coefficient?